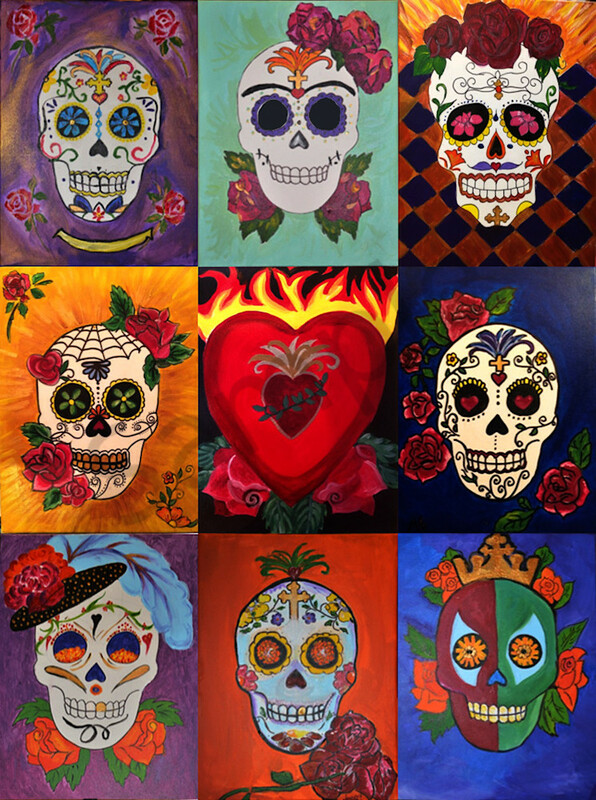 These Sugar Skulls were painted by Rosemary Tuthill's Paint and Sip Party students. She assisted on each painting. The images were individually photographed and assembled into this unique collage. Dia de Muertos – Day of the Dead, also called All Souls and All Saints Day, is celebrated throughout Mexico and the Catholic world... Italy, Spain, South America and the Philippines. It is a festive, joyous time of celebration. The belief is that the gates of heaven are opened at midnight on October 31, and the spirits of all deceased children (angelitos) are allowed to reunite with their families for 24 hours – November 1st. November 2nd is the day for horning deceased adults.